Vinyl zig zaggy zip pouch - on the cheap! Bought this great strawberry print vinyl in LA the other day for just $2 a yard. I needed a little something to go in a secret sister gift for Rebekah's volleyball game today, so this is what I made. A strawberry zip pouch. Fold the vinyl and cut it at 6" x 10". The fold is at the bottom of the bag. Sew the zipper in at the top by folding under a bit of the edge of the vinyl and zig zagging in onto the zipper. I had to trim the end of the zipper off a bit. Tuck the ends of the zipper under as you sew, but point them towards the bottom of the bag just a bit so the zipper can zip all the way open and closed without getting caught on the folded under ends. Zig zag up both sides, and you're done. I think what I like most about this project is that it took less than 10 minutes to make and it costs about .35 cents. The vinyl was only $2.00 and the zipper was .25 cents. Since I only used a tiny bit of the vinyl, I'm coming in at only .35 cents!! Love it. 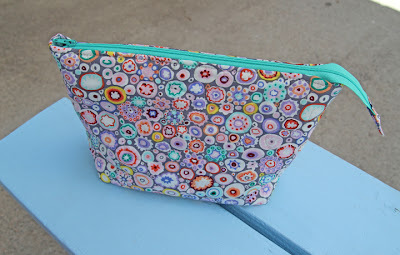 Super cute for a pencil pouch so you can see all that's inside! I love this! Lets get together and make hundreds of them!! There is just something about a zippered pouch. and one that has strawberries on it is killing me. I LOVE IT. You are so talented.